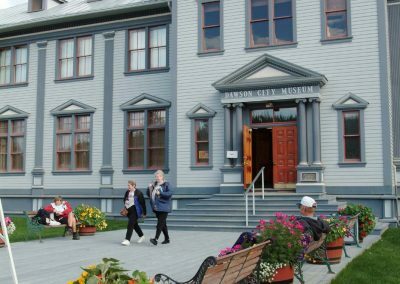 Pedestrian Friendly – most of Dawson’s major attractions are centrally located and within a short walking distance from each other. 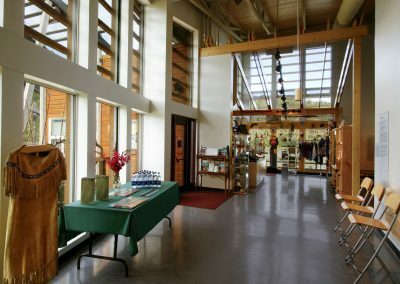 This makes getting around town easy and enjoyable. 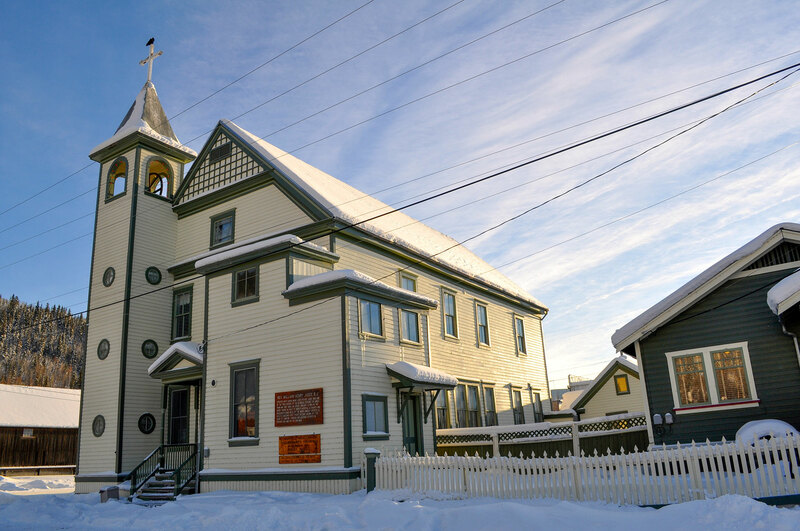 Regional History – A National Historic Site, the Dawson Historical Complex encompasses much of the town. 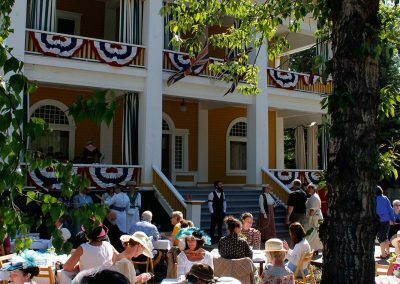 Glimpse into the glorious past of the gold rush era, and be a part of its remarkable living history. 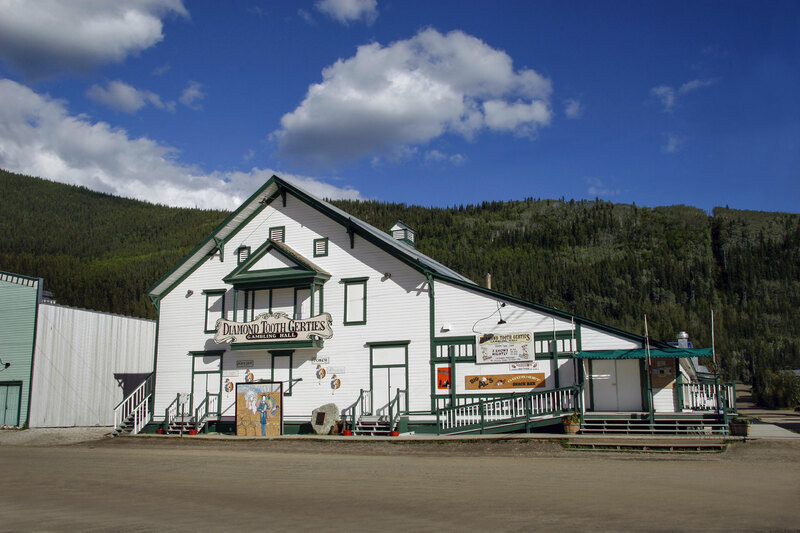 First Nations Culture – Dawson City is home to the Tr’ondëk Hwëch’in people. 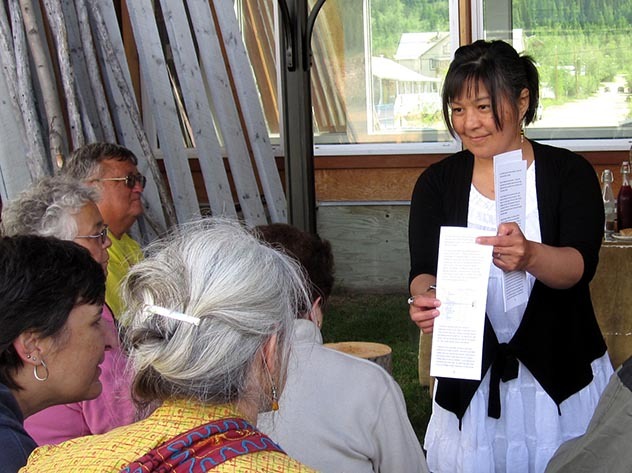 Their rich and vibrant culture remains an integral part of the community. 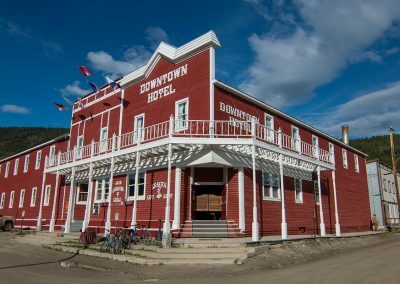 Unique Venues – Dawson City boasts some of the most unique and affordable venues. 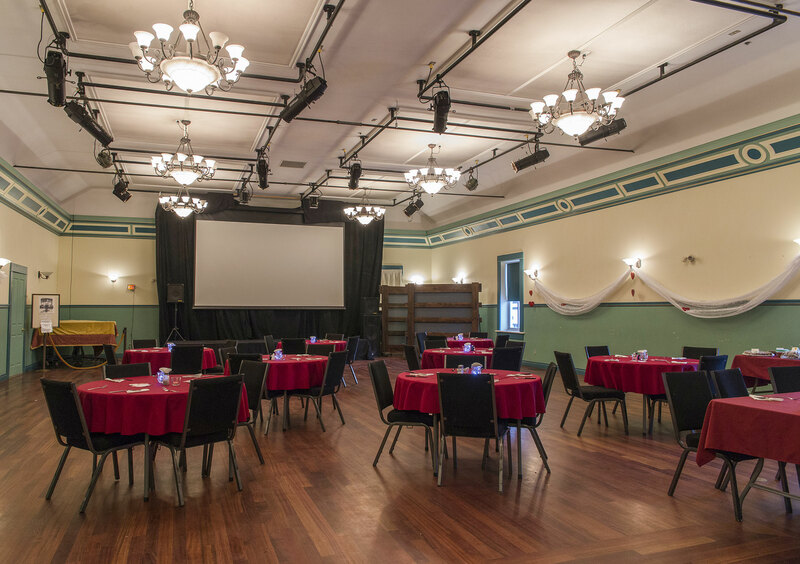 Host your wedding reception in the beautiful Odd Fellows Ballroom or your corporate meeting atop the Midnight Dome. 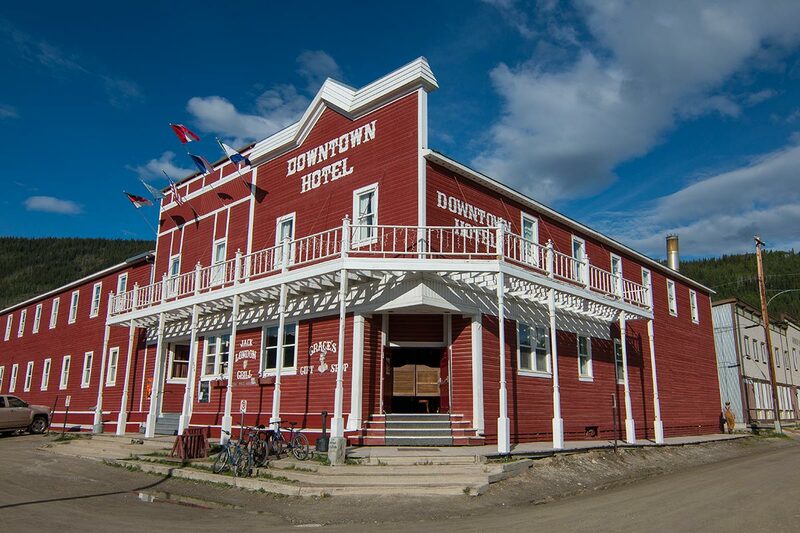 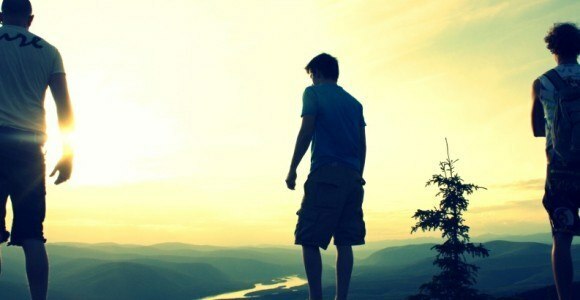 Spectacular Scenery – With enchanting vistas around every turn, Dawson City is truly a remarkable wonderland of sights. Festive Events – From Spring Carnival to Discovery Day Celebrations, there is always an exciting community event happening in Dawson City. 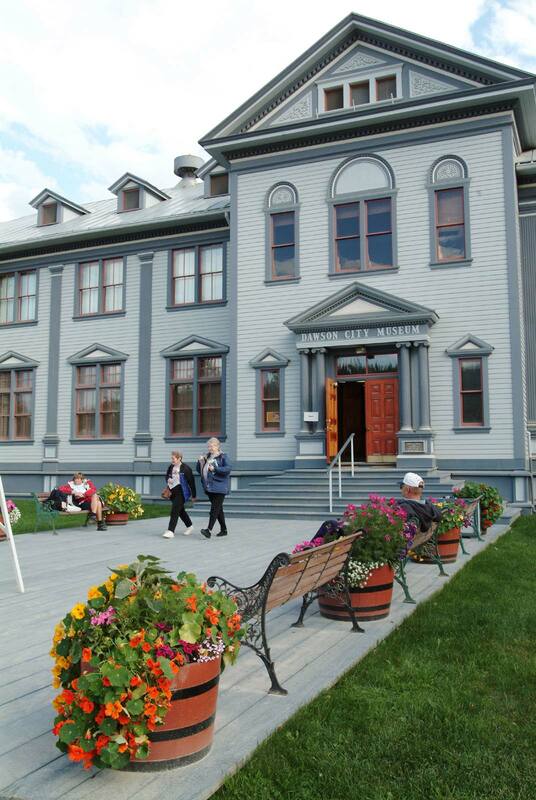 Completed in 1901, the Commissioner’s Residence was a symbol of prosperity and permanence in the community. The Residence has been restored to the era of Commissioner George Black and his wife Martha (1912-1916). 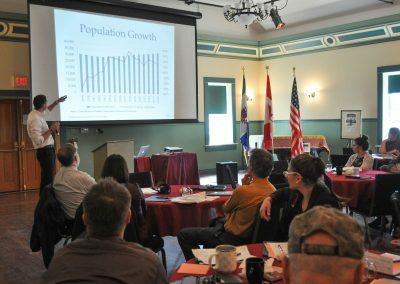 Fort Herchmer was 40 acres of dominion government land reserved for the establishment of a new post for the Northwest Mounted Police. 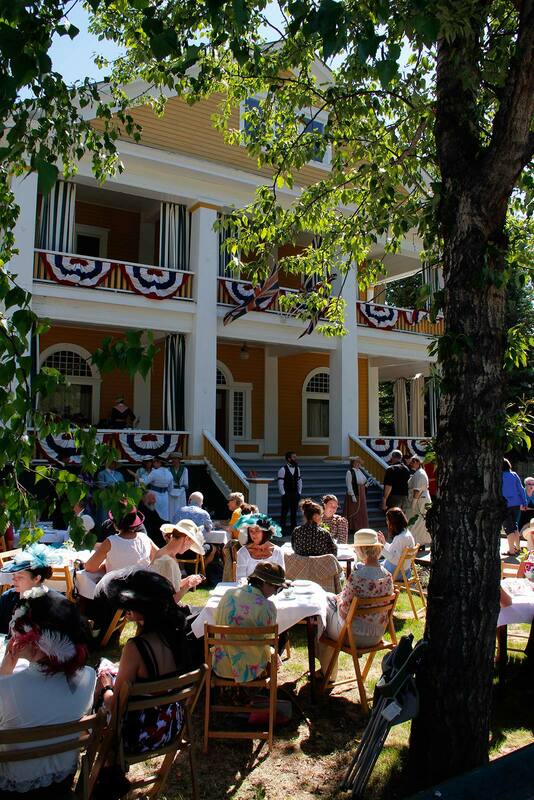 This historic green space is perfect for a luncheon, a corporate event, a wedding reception or an outdoor concert. 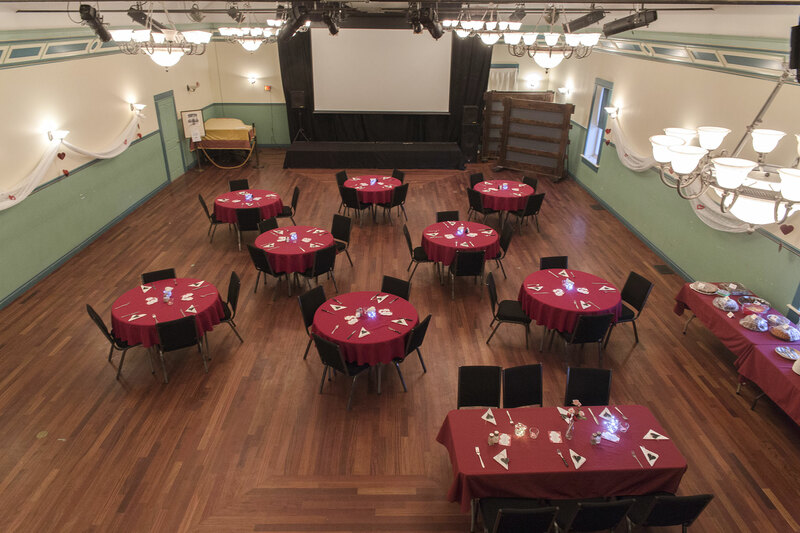 It can be adapted to a multitude of events, and can offer seating for up to 250 people. 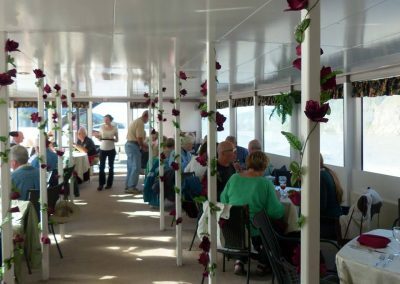 The veranda offers comfortable seating for 60 people. 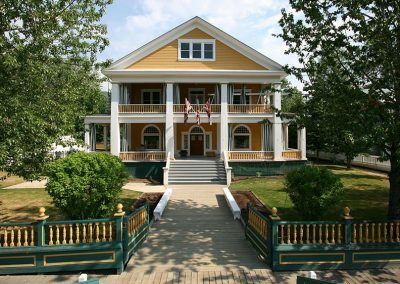 Elegant and stately, the veranda offers a charming and cozy setting for a small reception or an impressive architecture for a wedding ceremony. 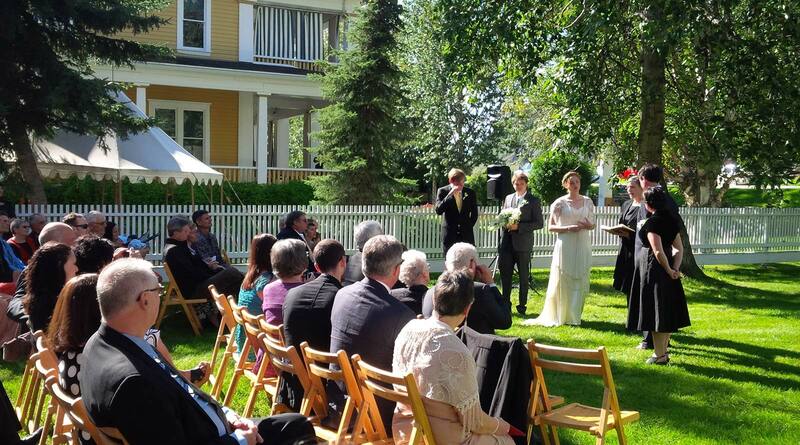 Surrounded by deciduous trees, the lawn and Martha’s lovely flower garden offer a quiet and spacious setting for outdoor wedding receptions, culinary events or meetings. 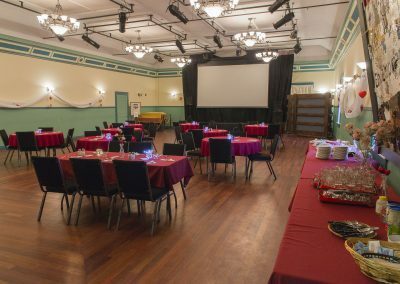 Please note that the actual residence is not available for event rentals. 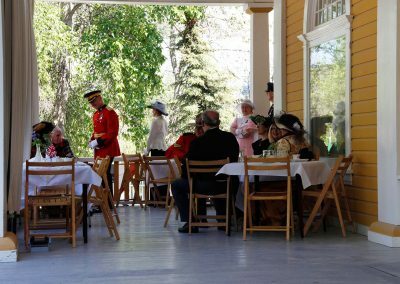 The veranda and grounds only are available. 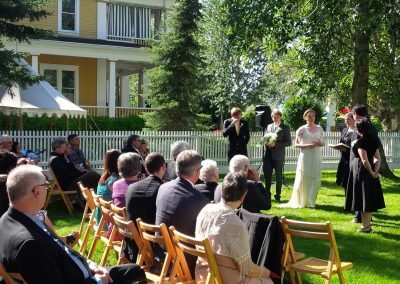 The grounds of the Commissioner’s residence is available for small wedding ceremonies (up to 50 ppl) for $50 fee, provided no setup assistance or cancelling of Parks programming required. 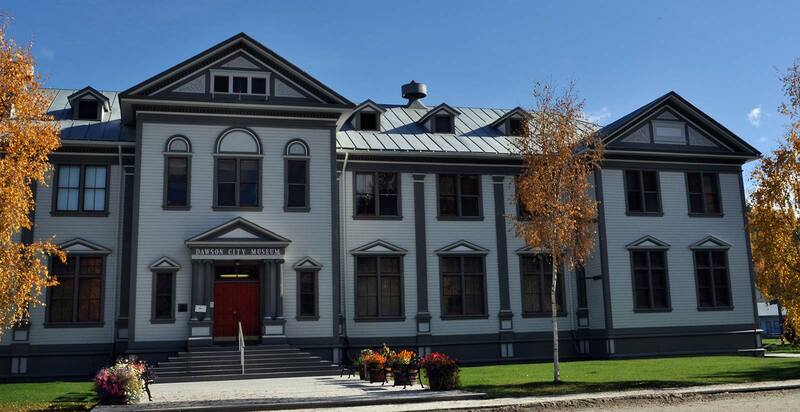 Situated just at the south edge of town, the Crocus Bluff ball field is a great setting for family fun, with or without actually playing baseball! With ample parking and a concession and washrooms building, this site is ideal for casual outdoor enjoyment. 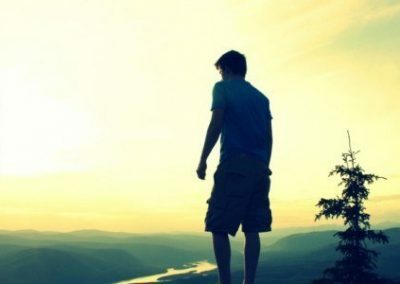 Price per day: $100, with concession add $100. Dänojà Zho is a year round, fully accessible, non-smoking, no alcohol facility. 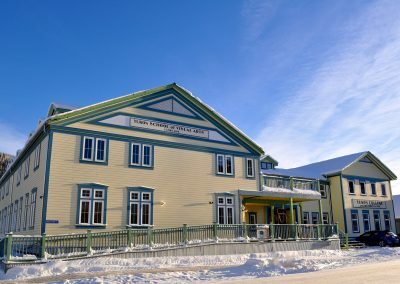 Dänojà Zho is an excellent location for hosting meetings, open house/information events, community functions, lecture and slide shows, fundraisers, concerts and performing arts presentations. 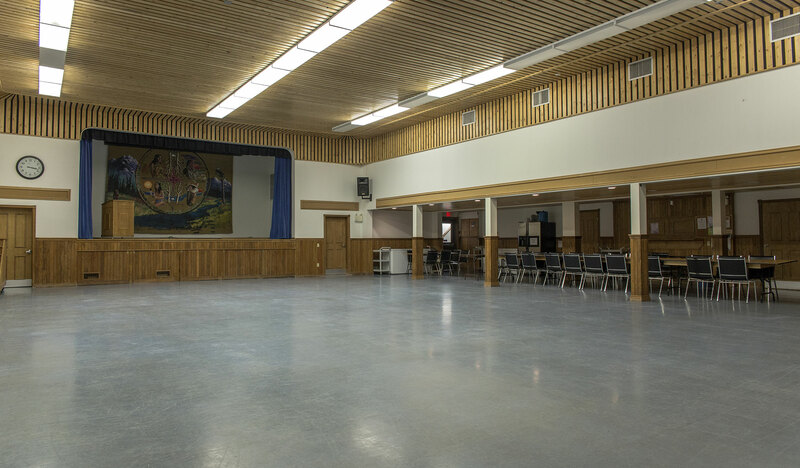 The Gathering Room is illuminated by floor to ceiling windows and an unobstructed view of the Yukon River. This room is suitable for seminars, meetings, small receptions, presentations and concerts. 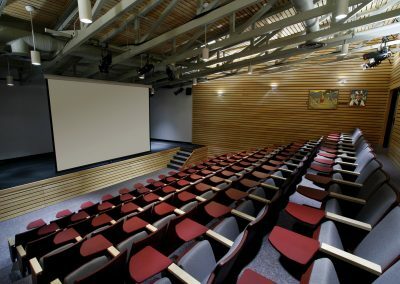 The 90-seat Theatre (with lap desks) provides a perfect location for both audio/visual presentations and live performances. 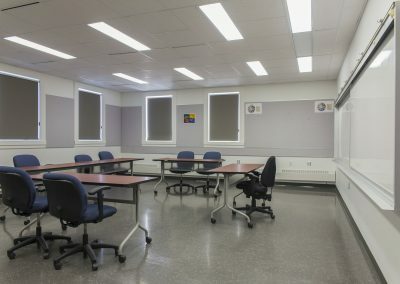 Services include sound and light systems, audio / visual equipment, flip charts, kitchenette, outdoor decks and terraced amphitheatre style landscaping. 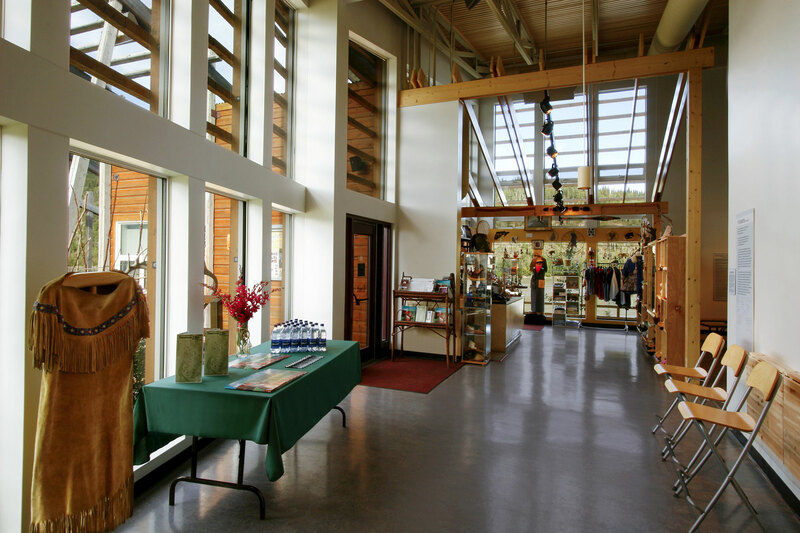 There is ample parking and the Centre is an easy walking distance from all hotels, and visitor attractions. 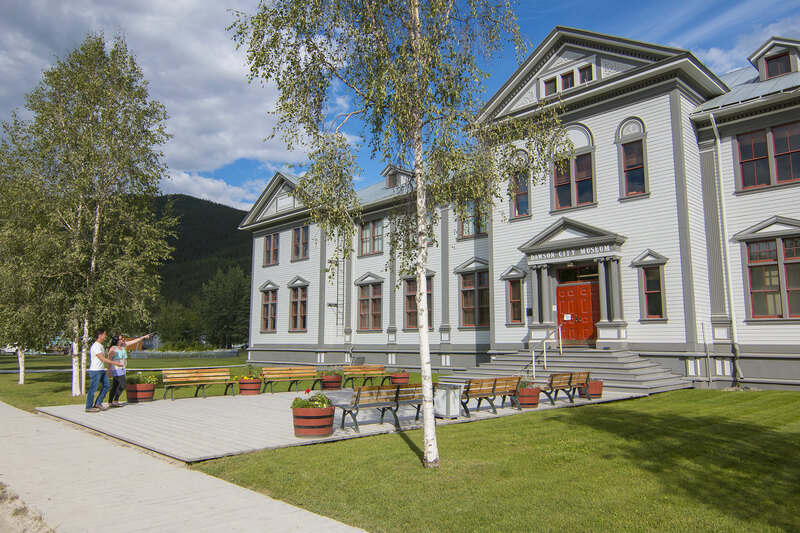 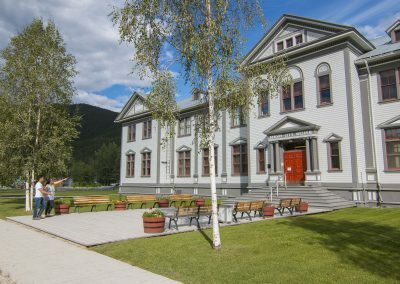 Dawson City’s beautifully restored former Territorial Administrative Building. 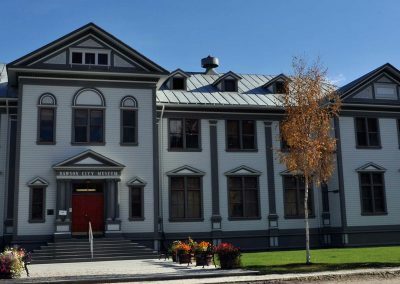 Designed by architect Thomas W. Fuller, the building was constructed in 1901. 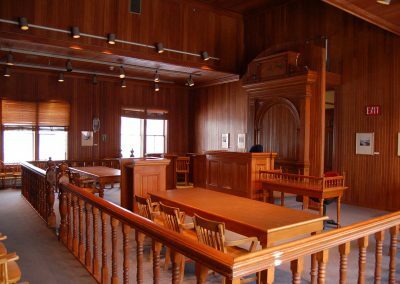 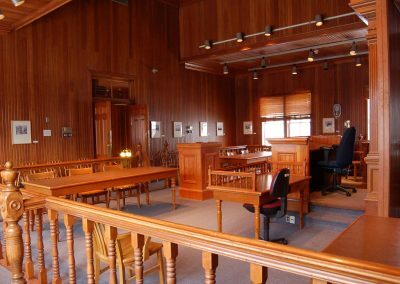 The museum offers three different options for hosting your events: the theatre, the gift shop gathering space and the courtroom. 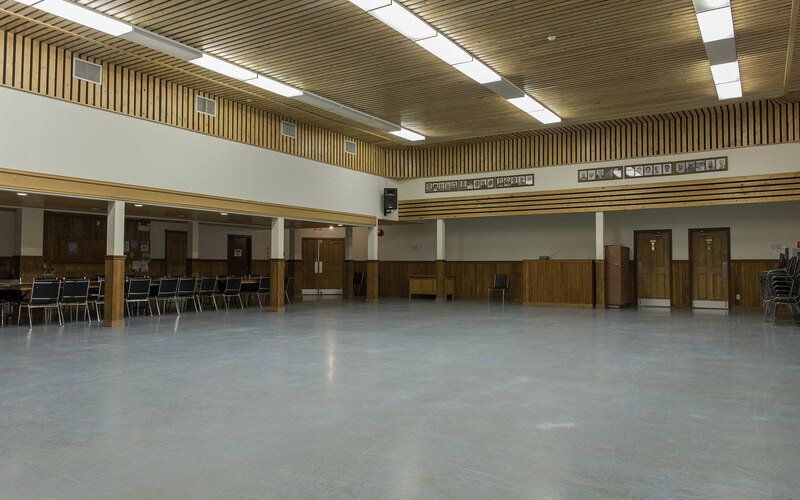 The Curling Club offers a relaxed atmosphere with floor to ceiling windows over looking the ice. 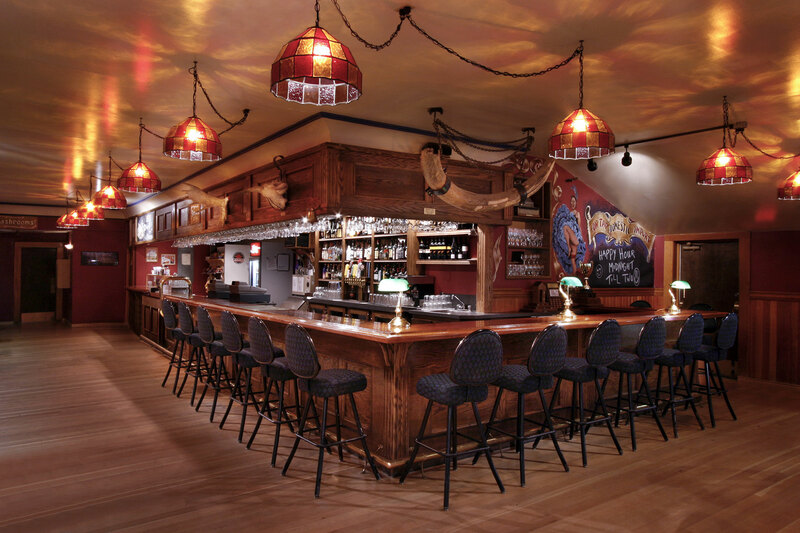 The lounge is approximately 20’ x 30’ in size, and offers a large commercial kitchen and bar for events. 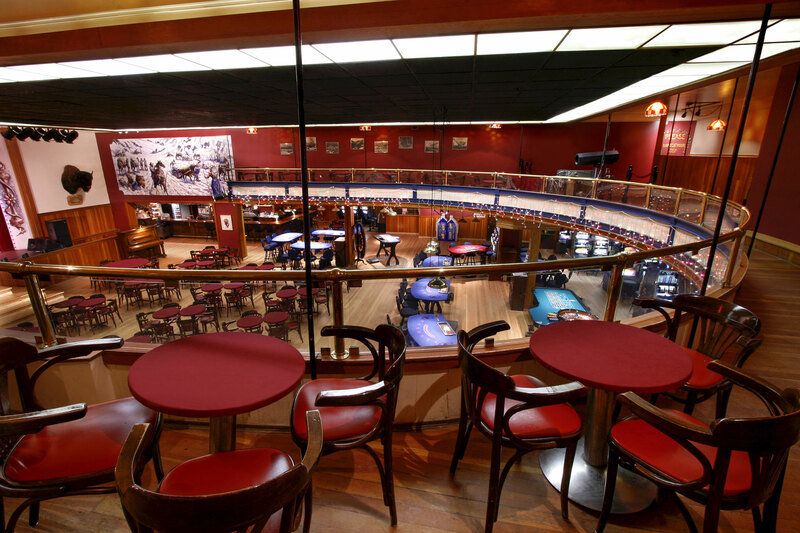 There’s even an old-timey snooker table! 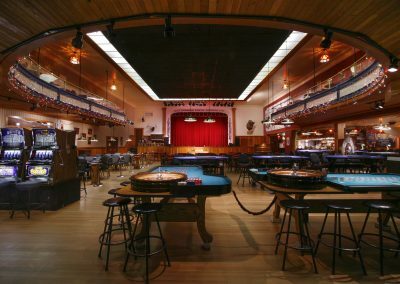 The only gambling hall North of 60, the historic Arctic Brotherhood hall features nightly gold-rush era inspired entertainment and games of chance all summer long, but during the shoulder seasons this venue can host large groups for unique events. With slot machines for backdrop and club table seating, this venue provides frontier character with a beautiful bar and upper level gallery seating for a view of whatever show is happening on stage. 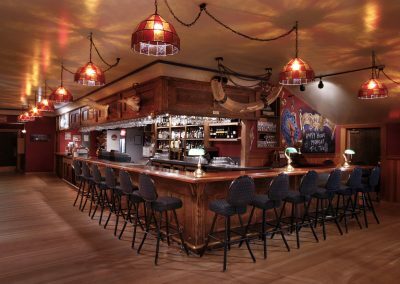 Diamond Tooth Gertie’s Capacity is 300 for regular seating. 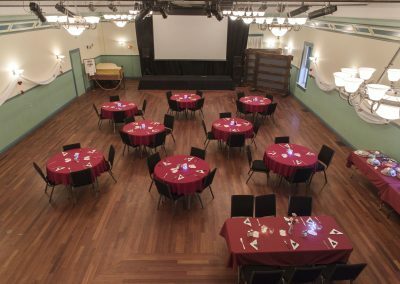 Dinner seating capacity is 175. 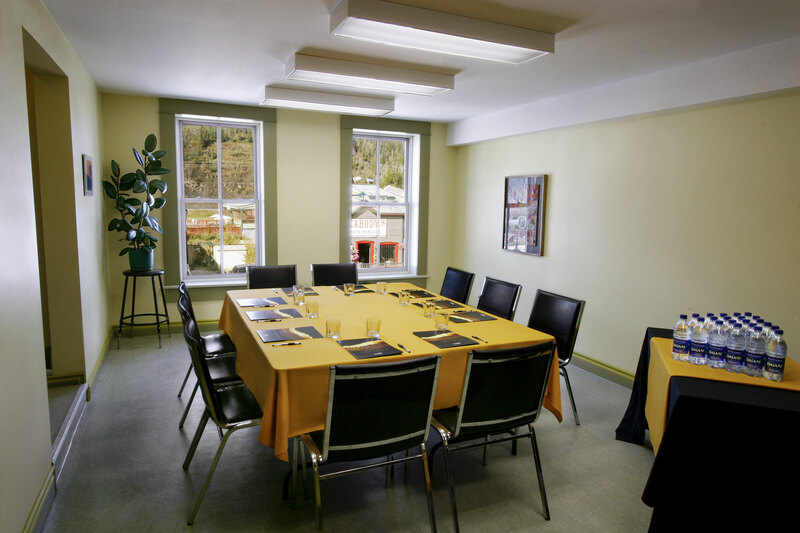 Approximately 20′ x 40’ in size, the conference room offers full services for your events. 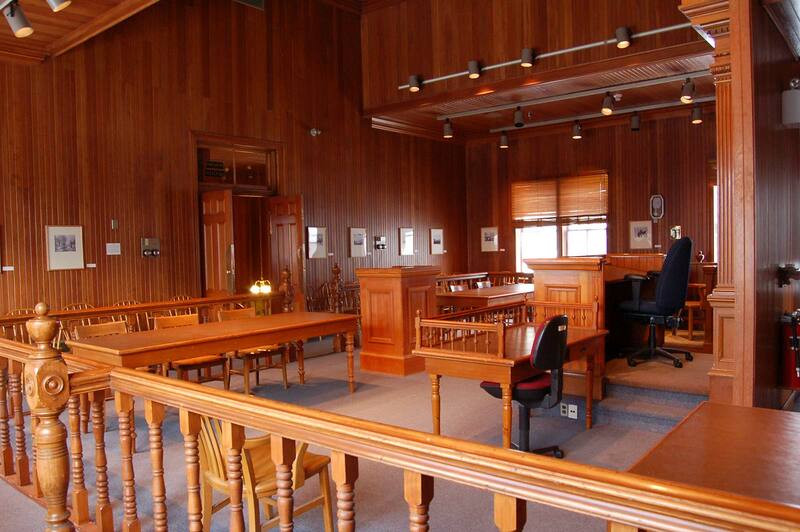 Let us know what you’re planning, and we’ll make it happen. 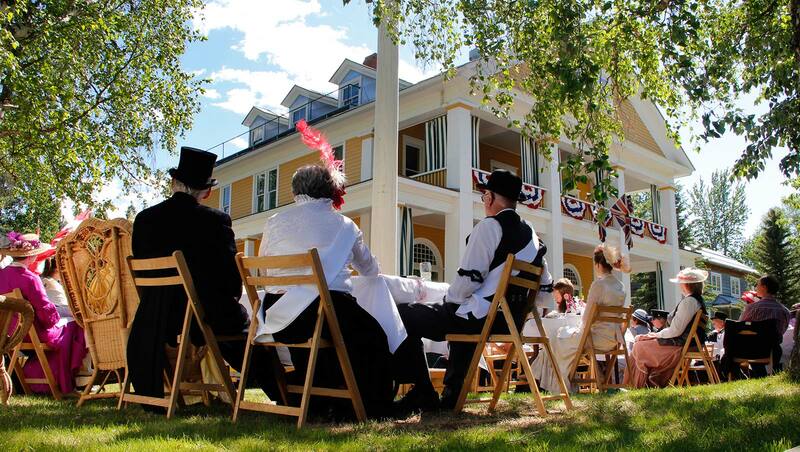 The gazebo located in the park along Front Street offers a quaint yet central setting for an outdoor meeting or ceremony. 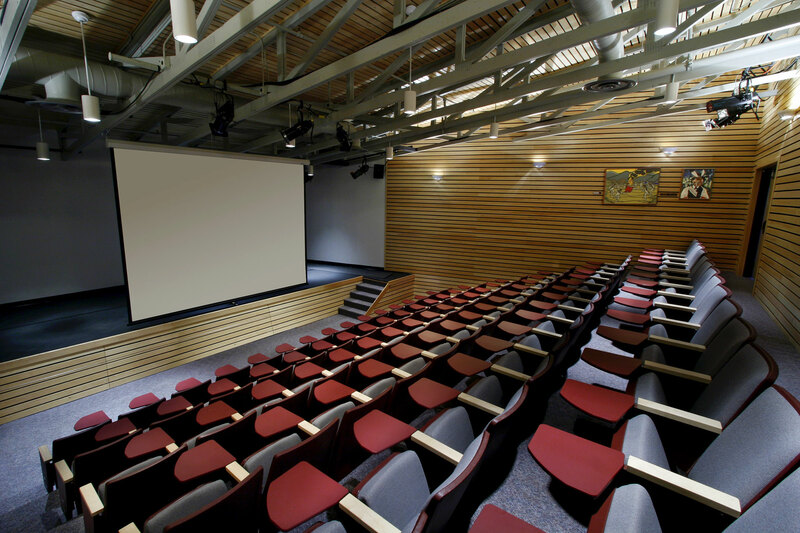 The natural amphitheatre seating makes it ideal for music or other performances. 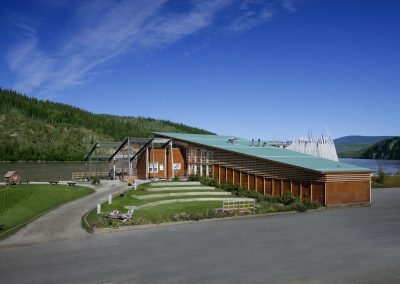 City of Dawson Rec Dept. 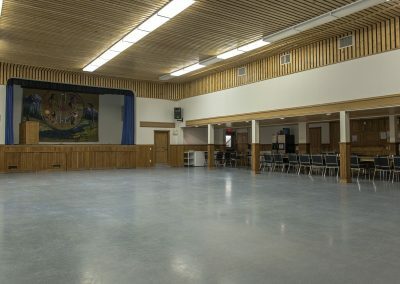 The Picnic Shelter, located at the base of Princess Street at Front Street Park, offers a sheltered outdoor space for a variety of events. 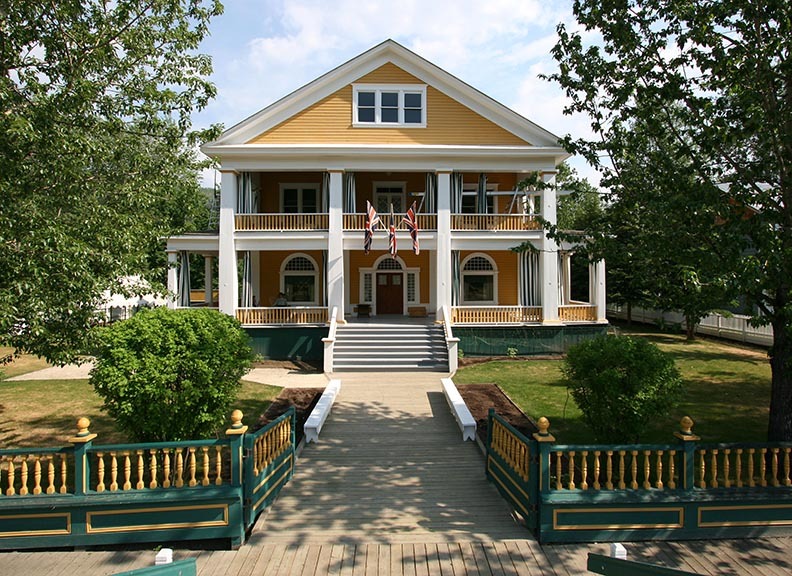 Hidden within the picturesque Sunnydale slopes, the Dawson City Golf Course offers the perfect escape from the ‘bustle’ of downtown. 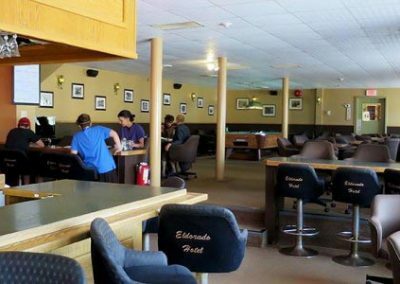 Play a round, hit a few balls at the driving range, or simply enjoy the incredible wildlife viewing opportunities from our clubhouse patio. 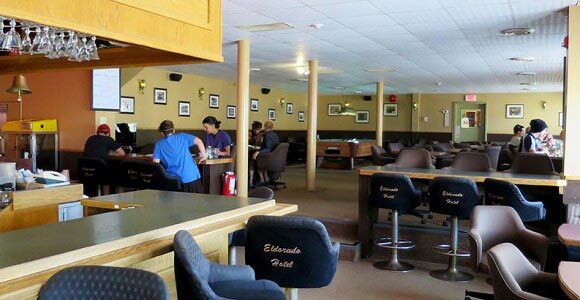 The clubhouse is ‘rustic’ but the setting (complete with campfire site, beautiful tall spruce framing views of the fairways) is lovely—it’s ideal for casual, fun events. 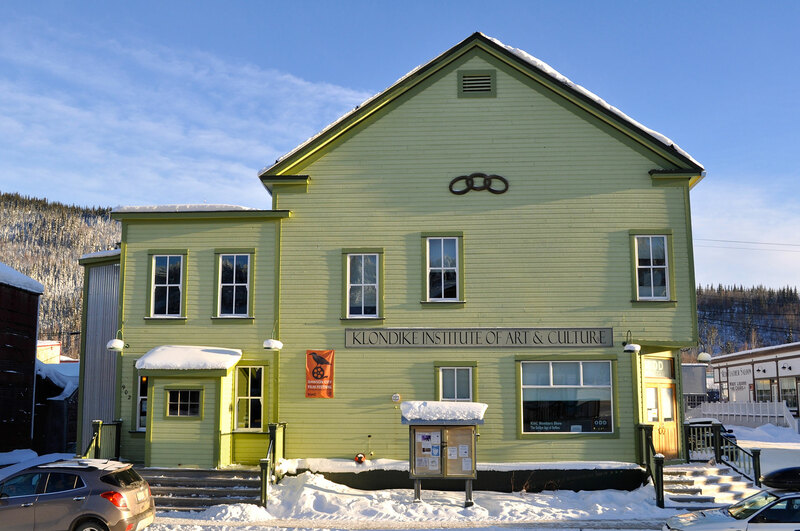 The Klondike Institute for Arts and Culture (KIAC) is a community-based arts centre housed in the historic Oddfellows Hall. 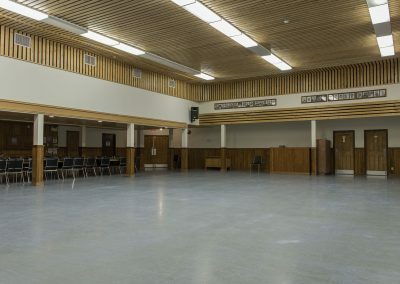 The KIAC Ballroom offers approximately 2000 s.f. 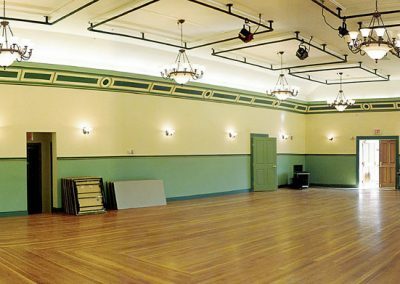 of elegant space, featuring 15’ high ceilings and chandeliers, beautiful hardwood floors, and a small but functional kitchen. 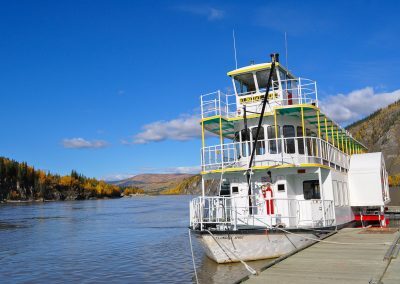 Enjoy a nostalgic journey aboard the only operating paddlewheeler in the Yukon. 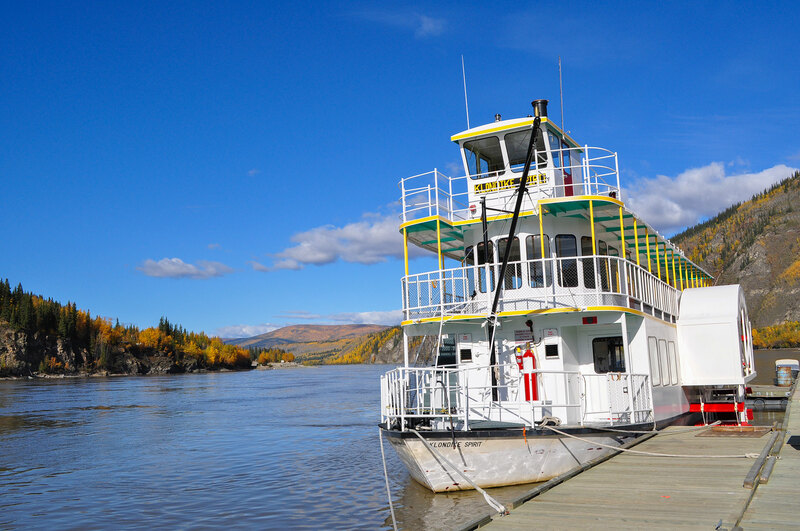 Sit back and relax while we take you through the beautiful landscape along the Yukon River. 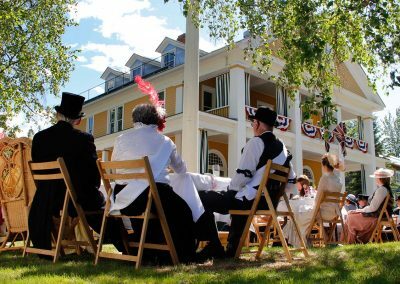 Want to celebrate a wedding in a unique way? 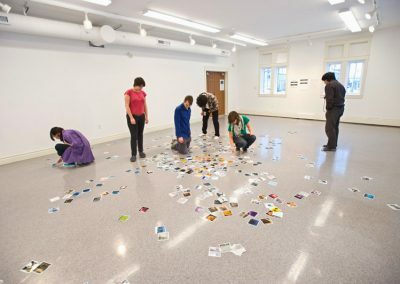 Interested in organizing a party to remember? 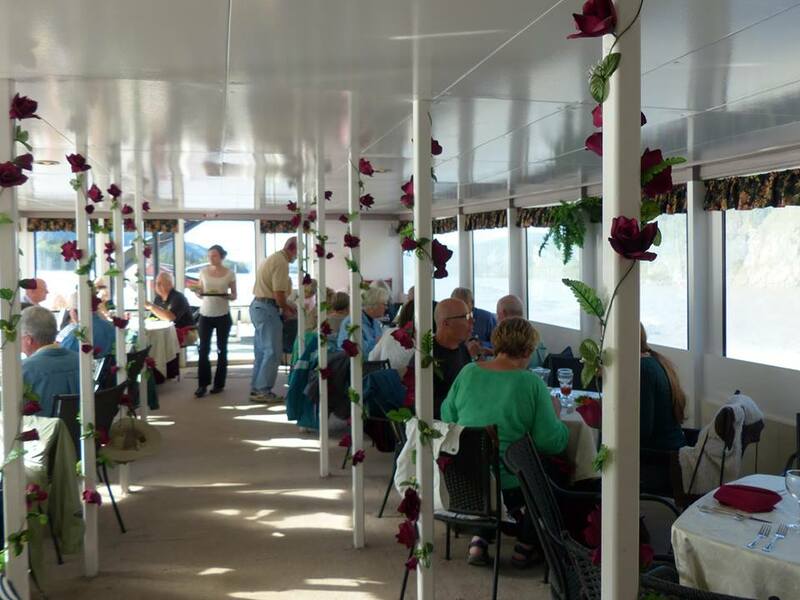 The Klondike Spirit is available for all kinds of special events! 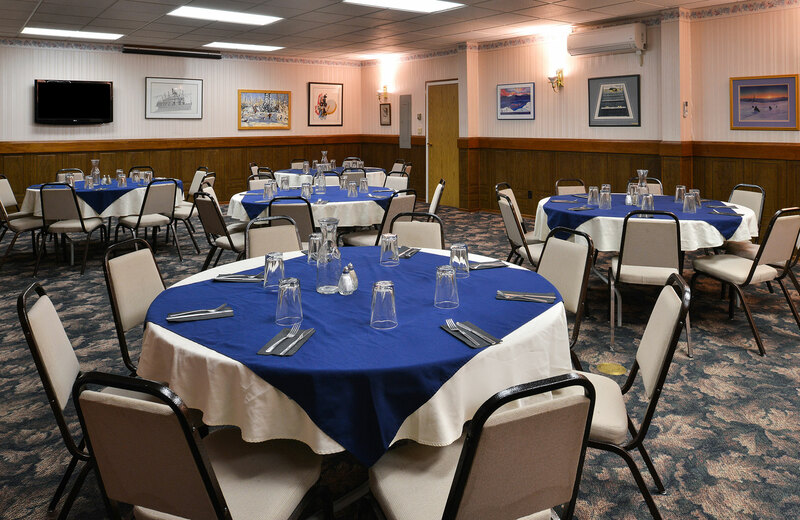 We can provide food service for your event and will do our best to meet any special requests. 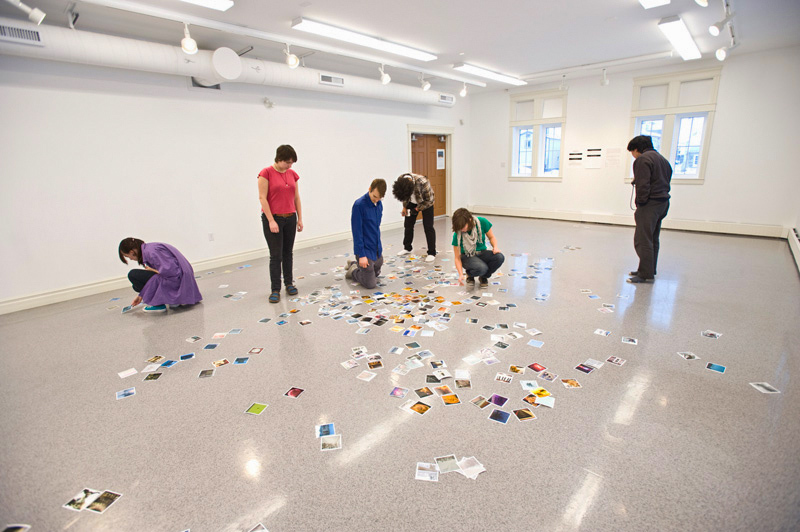 You just have to contact us, we are eager to help create what you have in mind! 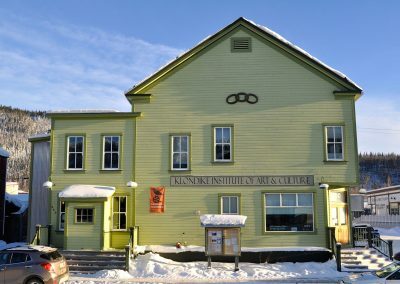 Price per day: Klondike Spirit river cruise charters are $1500 for the first hour, and $600 per half hour after that. 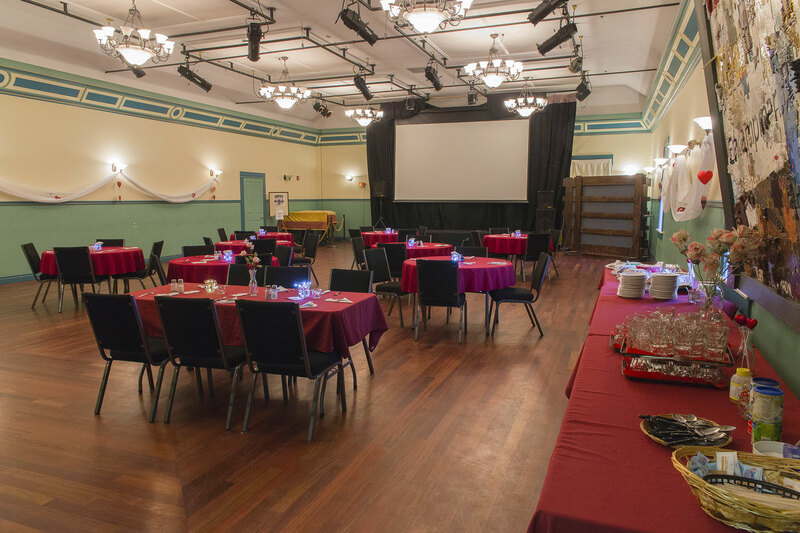 The Spirit can be made available as a venue sitting at dock, but there is no set price for this. 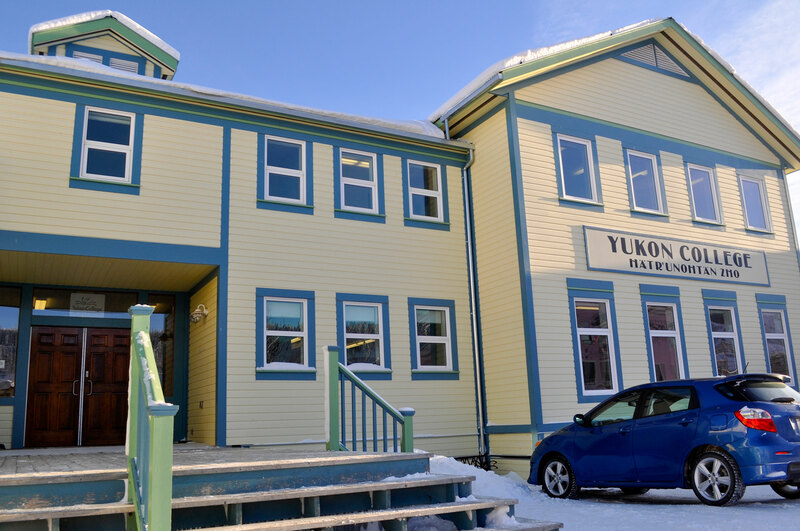 The Dawson City Branch is one of only two Legion Branches left in the Yukon. 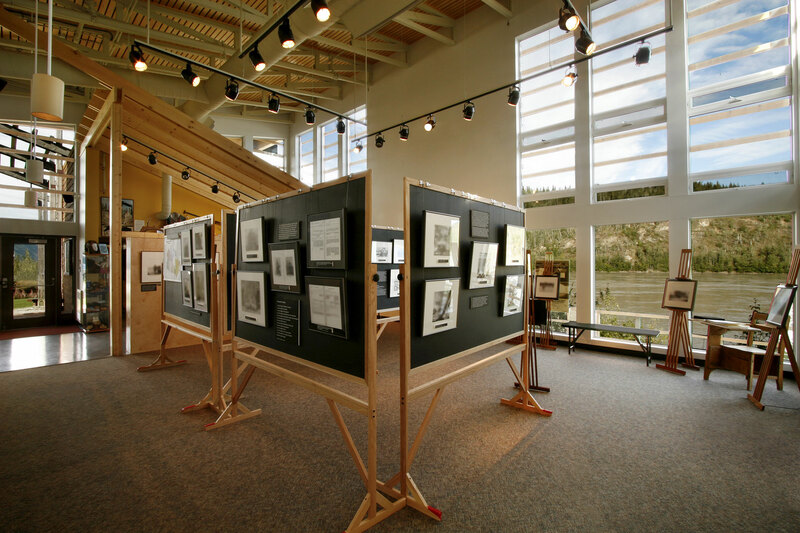 The walls are lined with photographs from Dawson City’s heyday following the discovery of gold in 1896, and this approximately 16’ x 20’ space nicely accommodates a casual meeting or party. 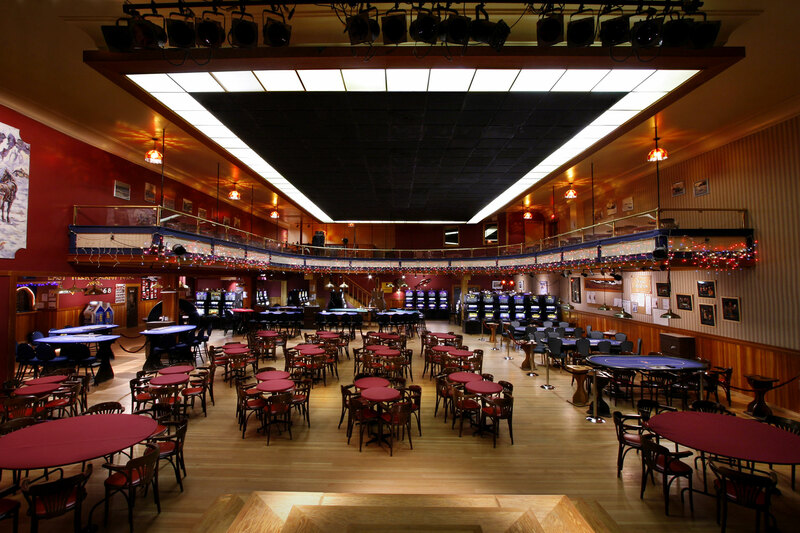 Arizona Charlie Meadows built the Palace Grand in 1899, a lavish theatre in the wilderness. 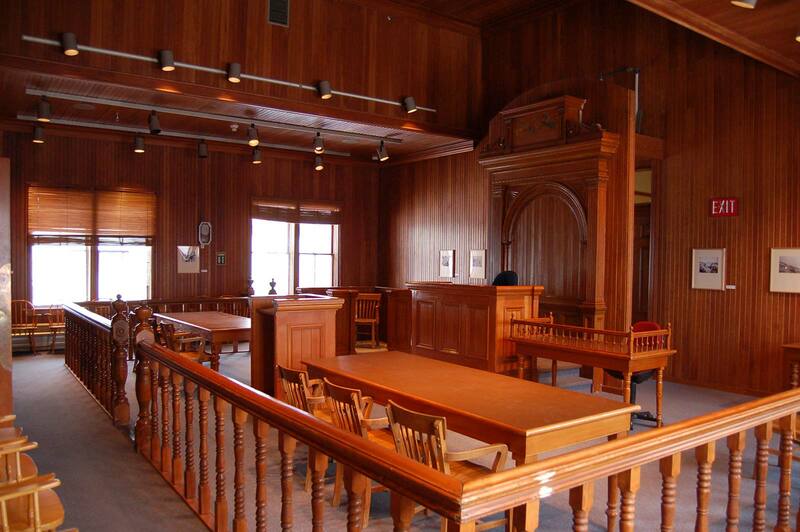 After declining into disrepair it was carefully replicated in the 1960s. 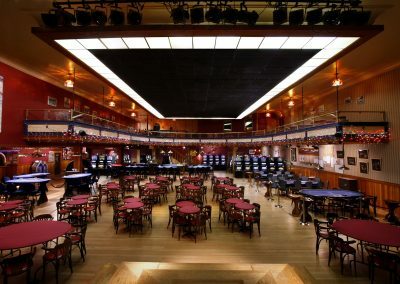 Now the Palace Grand serves as a gorgeous, multifunctional venue. Whether you are planning a reception, a ball, a conference, a play, a rock concert or a recital, the Palace Grand Theatre offers a vibrant space to suit your needs. 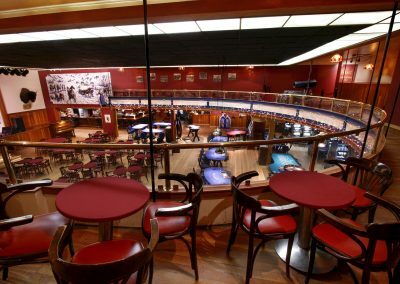 Palace Grand Theatre capacity is 300 for theatre-style seating. 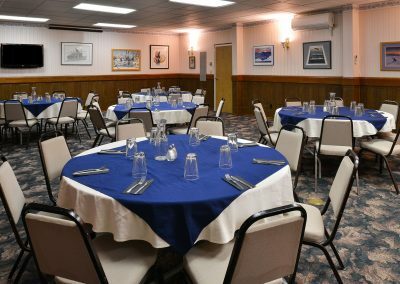 Dinner seating capacity is 150. In St. Mary’s the church sanctuary is upstairs and the downstairs space, which used to serve as a schoolhouse, is now available as an area for gatherings. 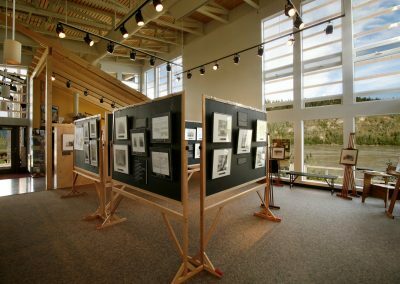 The approximately 20’ x 35’ hall features simple, but lovely, details and the walls are decorated with historic photographs. 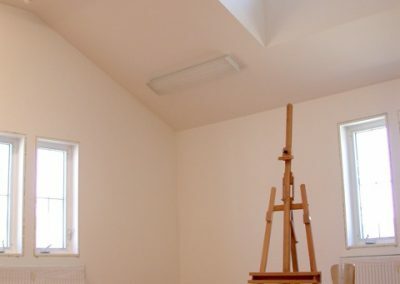 Price per day: $150, with kitchen add $50. 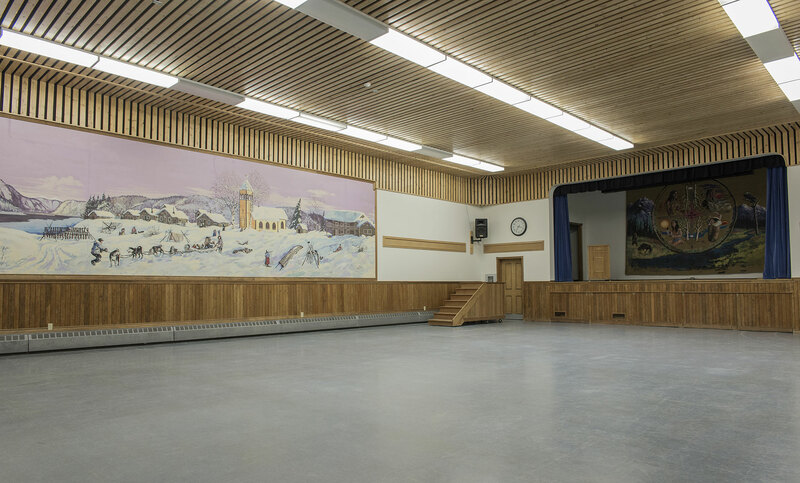 The Tr’ondëk Hwëch’in Community Hall is a large (approximately 30’ x 40’) space featuring a mural depicting a winter scene at Moosehide village, a stage and a commercial kitchen. 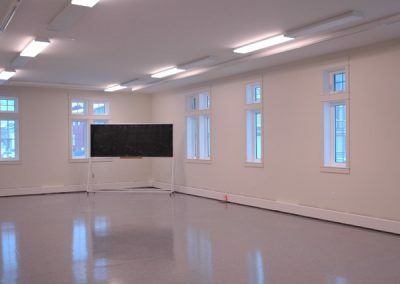 Price per day: $250, half-day: $150, with kitchen add $150. 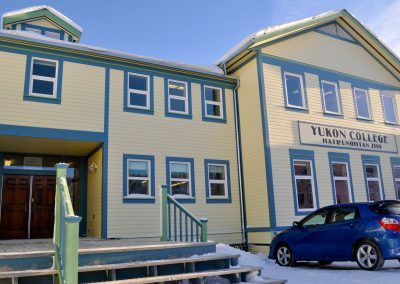 The Yukon Order of Pioneers was organized on December 1st, 1894 at 40 Mile, YT, Canada, before any law organization existed in the Yukon Valley. 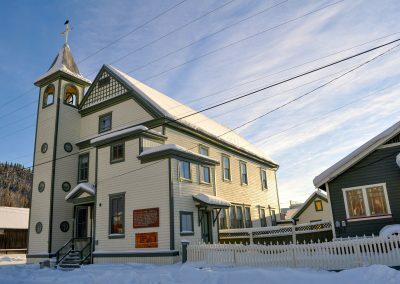 As a substitute the first Pioneers adopted this rule which became the Motto of the Order: “Do unto others as you would be done by”. 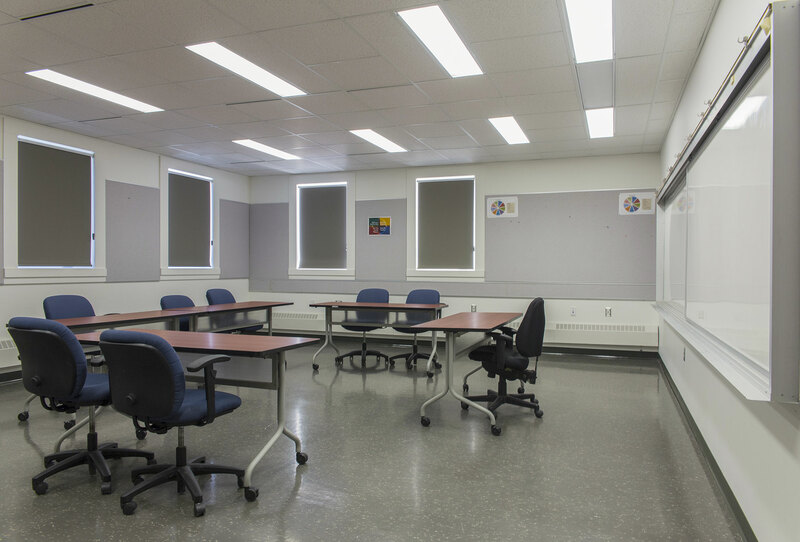 Price per day: $400, half-day: $200, non-profit: call. 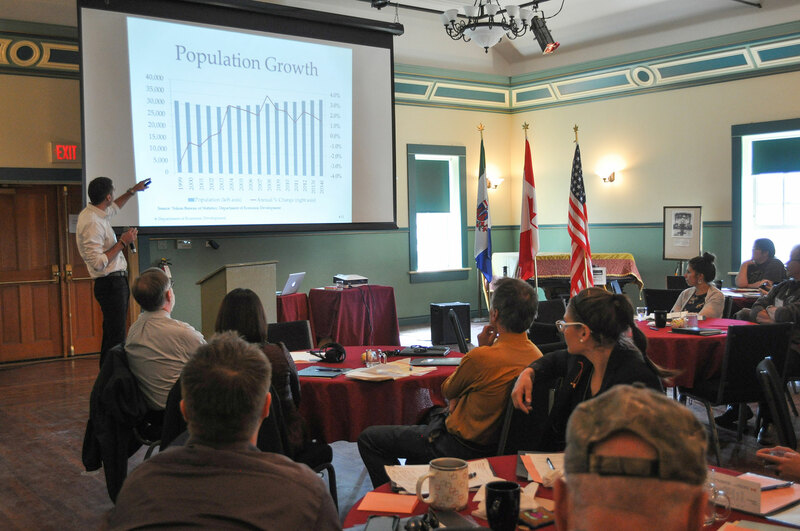 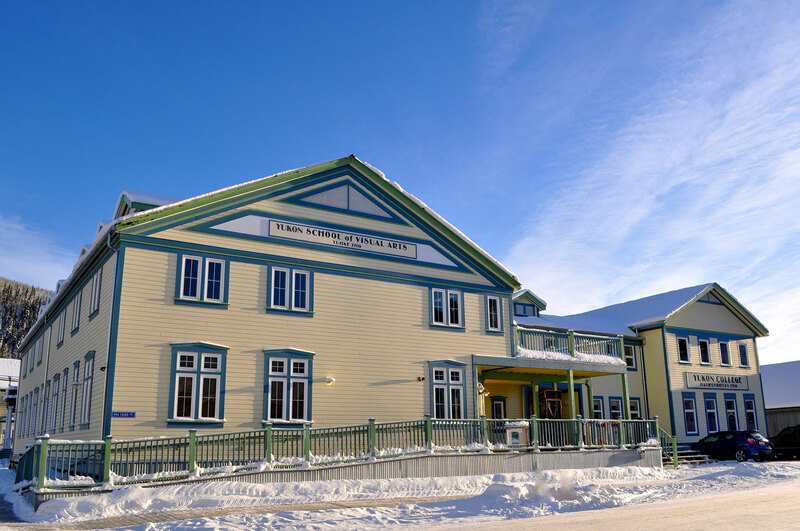 This facility constructed in 2011 is a hub of activity, meeting the educational and training needs of Dawson City. 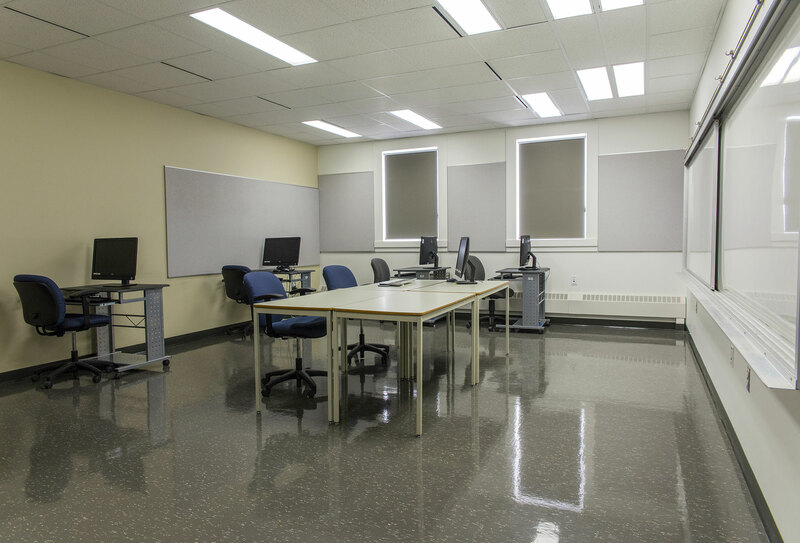 The college offers three spaces for rent: an open gathering space downstairs, and two classrooms upstairs. 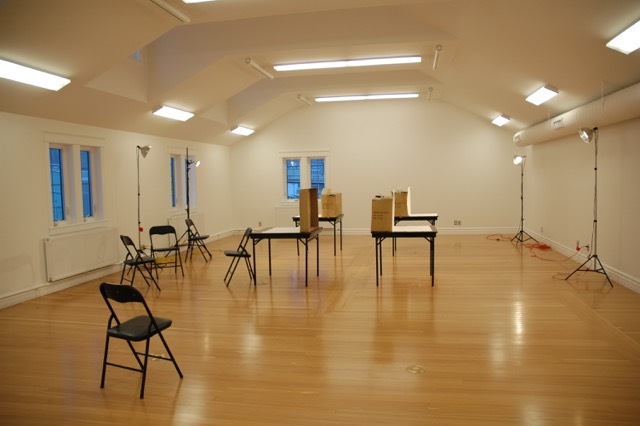 The 2D studio is a wonderful room with hardwood flooring and an eighteen-foot ceiling. 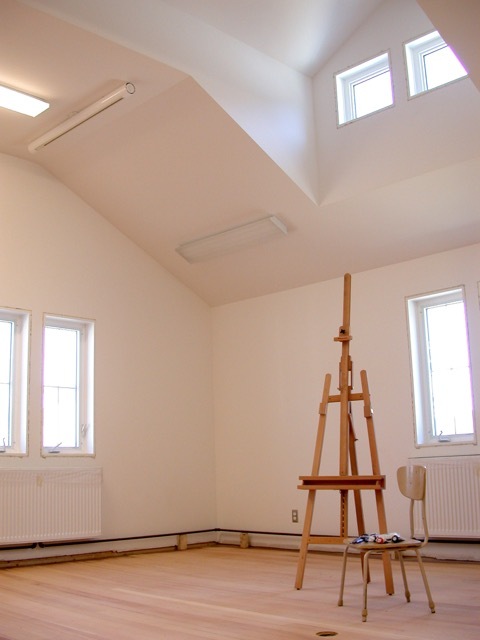 Casement and dormer windows along two walls provide natural light. 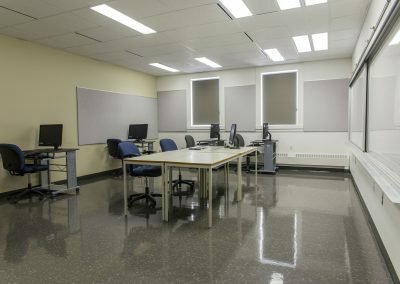 This space features an eighteen-foot ceiling, hardwood flooring and screens at opposite ends of the room enable digital presentations. 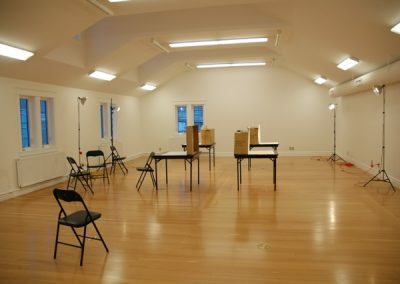 The room can be arranged for a variety of purposes.